Preheat oven to 375 degrees F with the rack in the middle position. Grease baking sheets or line with parchment paper (we actually used a Whoopie Pie Pan. Break the chocolate squares into chunks, place in a microwave-safe bowl and microwave on High until the chocolate melts, about 90 seconds. Stir the chocolate until smooth and set aside to cool. In a large bowl, beat 1/2 cup butter, brown sugar, and white sugar until light and fluffy; pour in the egg and beat until smooth. Mix in the red food coloring and chocolate, scraping the bowl down regularly, until evenly blended, about 30 seconds. Add half of the sifted dry ingredients, stirring until well incorporated. Beat in the sour cream and mix in the remaining dry ingredients. 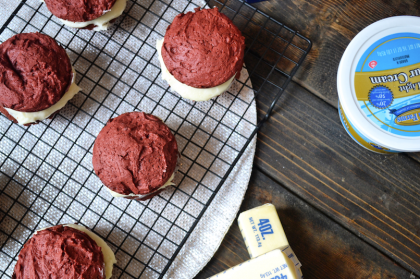 Drop spoonfuls of the dough 2 inches apart onto prepared baking sheets or Whoopie Pie Pan. Bake one sheet at a time in the preheated oven until they spring back when pressed, about 9 minutes. Cool in the pans for 5 minutes before removing to cool completely on a wire rack. 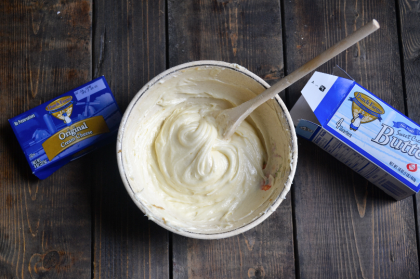 For the cream cheese frosting, whip 1/4 cup butter, cream cheese, and vanilla until smooth. Blend in the powdered sugar in half cup portions until the frosting reaches the desired consistency. 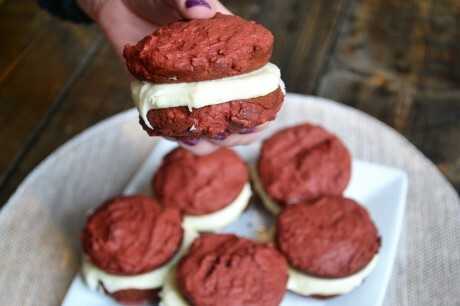 Spread the cream cheese frosting on the inner side of a cookie and place the inner side of another cookie on top to create each Whoopie Pie.